This gorgeous much-loved character holiday home of an interior designer/ art director is full of retro style yet offers all the comforts of a modern home. 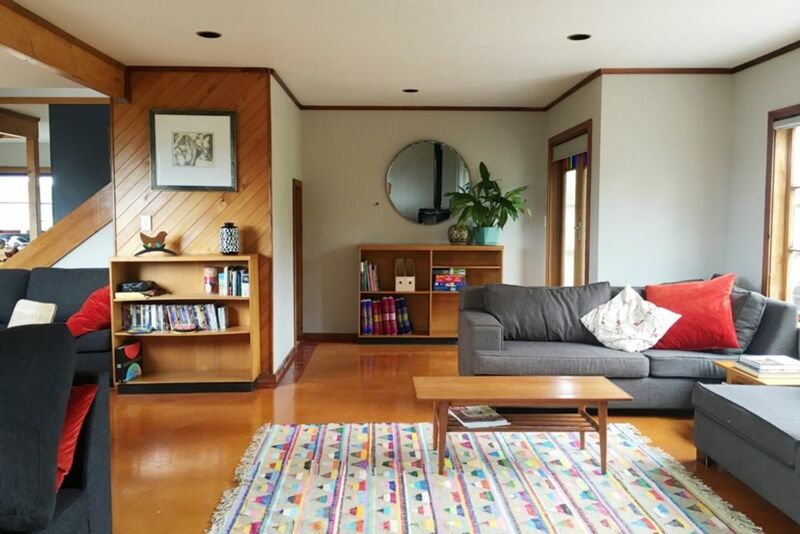 It's a funky 1950's-1970's renovated home, with character features and a great layout. The house is elevated across three levels with decks off the living areas and 3 of the bedrooms so you can follow the sun all day, and there are sea and mountain views every direction you look. The spacious top floor contains 1 king bed, a divan daybed and an ensuite. The middle floor has 2 queen bedrooms with sea and rural views and decks. The newly renovated kitchen has views to mount Karioi, a smeg freestanding oven and is well eqipped to cook for groups. There is an 8 seater dining opening to decking overlooking the bay. There is also a large open plan living with plenty of couches, a wood-burner and opening out to north facing under-cover outdoor patio with BBQ outdoor dining setting and big flat landscaped garden. Downstairs has two tiny bedrooms, 1 bunk and 1 king single bedroom + trundle with views of the windfarm. Perfect for friends and family getaways and set up well for children. Expansive views in every direction and quality comfortable furnishings, this home is about spending time with friends and family and enjoying the landscape and everything Raglan has to offer. DVDs and puzzles and some children's equipment available. Perfect town location with bay walks and everything you need 5 minutes drive away. Locals access to the bay at the bottom of the street walk swim at high tide and at low tide walk to the wonderful wharf with shopping and infamous fish and chips. Raglan's famous surf beaches a 10-minute drive away. Wifi included. Check out more pictures of the property and info about our favourite things in Raglan on instagram @arapikihouseraglan. Please let us know the age range of your group and the purpose of your trip when you make a booking request. Cleaning fee and linen is included in your quoted price. extra children 2-12 over four people have special reduced nightly rates- message us and we will apply the discounts. House is elevated over three levels and may not be suitable for the elderly, please contact us to discuss. Payment of deposit: Once we accept your booking a deposit must be paid AND received by us in order to secure the booking. Your booking will be confirmed upon receipt by us of the deposit. Failure to pay the deposit in time may result in your booking being cancelled and the property being made available to others. Should we cancel a booking of yours due to non or late payment of a deposit then any deposit received by us from you will be refunded in full. Pets are only allowed with prior agreement from owner and must be kept outside at all times and be cleaned up after. No parties or loud music/ noise allowed. House is in a residential area and the neighbours will let us know if there is excessive noise, cars or people. Any damages and breakages must be paid for in full. Large groups and long stays may be asked to provide a security bond for damage or breakages, which will be refunded post your stay. Absolutely no parties or loud noise allowed- bach is in a residential area. Smoking only outside. Breakages and damage must be paid for- large groups may be asked for a security deposit. I am a kiwi based in Melbourne where I run a sustainable interior design company. My husband and I set up Arapiki house in one of our favourite places in NZ, so that we could spend time with extended family friends in a relaxed and fun environment. In between we love others to have the same experience and we know many special memories have been made there. We fell in love with the 240 degree views in the property! Sea, mountains and a windfarm in the distance. We also love the different spaces and nooks to spread out in a large group and the easy access big flat backyard. The property has multiple stairs to the main living area- it may not be suitable for all abilities, however once on the main living floor there is a bathroom, bedroom all on one level. overall a great wekend . Home was sunny great position few minutes from town. verything we needed we found. only comment is that a gate at the top deck to keep young children from accessing stairs would be great. Perfect place to stay - we loved it! We really loved staying here! The house is set up perfectly for a holiday, and has everything you could need. Our kids loved the toys and the space to play inside and outside. The high chair and travel cot were so handy to have. My daughter left her beloved bunny behind and they were so lovely and posted it straight back to us! We love Raglan and will definitely be back. Thanks for having us! The house was perfect for our family. Great sized living areas and very comfortable. We really enjoyed our stay and will Definitely be booking this house again! Great house so spacious with everything we could need!